Do you and your family love pizza and Martin Luther School? 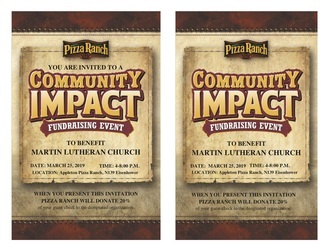 Then we have the perfect event for you- the R & R team is having a community night at the Pizza Ranch in Appleton. For every family who comes in that night with a Martin Luther voucher we will receive 20% of the sales from those meals – we will also receive 100% of all the tips from all meals that night. All funds raised that night will go towards Martin Luther Raise the Roof and School Safety funds. Please join us in a fun night of fellowship, food and community. All are welcome to come and eat, but we are also looking for VOLUNTEERS to help us clean tables and other necessary tasks for the evening. Please sign-up below.